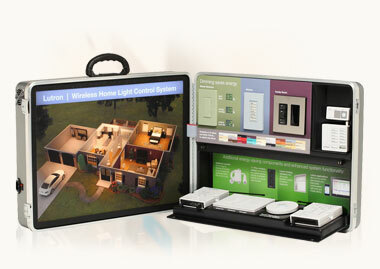 Conveniently control your lights from anywhere in the house or anywhere in the world via the Internet. Create, ambiance, save energy, and ensure home or business security and safety. Note: Not all lamps are easily dimmable; some compact fluorescent lamps can only be switched on or off. Control the lighting of your driveway, porch, backyard, etc. “Home” — Use the “Home” button as you’re approaching your house to turn on exterior lights, open the garage door and light a path to your home. “All on” or “All off” – Keep a keypad on your nightstand and another one by the entry door to turn on or off all lights in your house. Changing your existing lighting system to add multiple scene and dimming capabilities does not require rewiring your home!